It's really important to ensure that your catch remains as fresh as possible. Not only does fresh fish taste better, it's unlikely that you'll get sick upon eating it once it's cooked to perfection. There's nothing like taking a bite into something raunchy as all get out, right? Well, that goes for fish too. It can just as easily go bad just like most types of meat products. Keep the fish alive in the water whenever possible - either on a stringer or in a basket. Live wells that are built into the boat, and tubs or coolers with an aerator, are also another excellent way to help keep your fish alive. Keeping your fish alive isn't always possible for some people. Just understand that a dead fish, even in the water, spoils rapidly. Therefore, it's quite important to keep them cold, at the least. You could keep them iced down in a cooler. And/or wrapping them in a damp cloth or cheese cloth will also help. It's best to clean your fish within the first hour or two of catching it, and to cook it within 24 hours. Fish organs begin to spoil rapidly once they've died, so the quicker you get after cleaning it, the better. If you are not going to cook it right away, then freezing the fish should be done at once, but preferably after it has been prepared for cooking. Once you plan to use it for cooking, begin thawing the fish gradually in the refrigerator overnight or under cold running water. 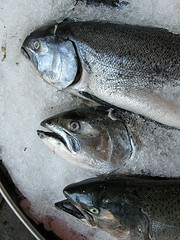 Do not refreeze the fish after it has been thawed. 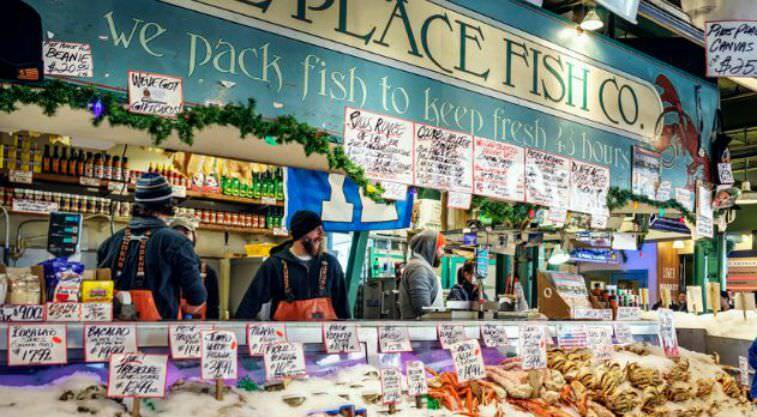 If you plan on buying your fish from a seafood market stand or your local supermarket, ask the deli clerk or the fishmonger what's fresh and new. Pick something out that satisfies yourself, and inspect the fish for yourself as well. The message on the wall reads ~ "We Pack Fish To Keep Fresh For 48 Hours""
Sometimes they'll have signs posted for new arrivals, daily deals, or a managers special. I would be careful with some of those because sometimes they could just be overstocked with old fish that they need to sell really quickly before it turns bad and they have to toss it out. Use your best judgement. If it smells "fishy," then most likely it's not good. It should smell like fresh water or like a crisp ocean breeze. Depending on the types of fish, they should have a rich looking color, and not dull looking and stinky smelling. Fresh fish should have clear eyes and pink gills, and no slime.